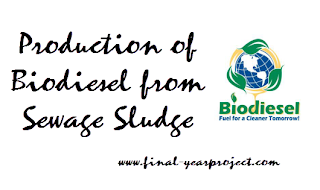 This is Chemical engineering project work on "production of Biodiesel from sewage sludge". Biodiesel is typically defined as the alkyl ester of a fatty acid. Biodiesel is produced by the trans-esterification of lipid feed stocks that are extracted from plant or animal sources. This project focused significant efforts on developing a potential lipid feed stocks for the production of bio-diesel using sewage sludge. Additionally several other methods are also discussed for the extraction of lipid from other alternate sources for the production of biodiesel. You can also Subscribe to FINAL YEAR PROJECT'S by Email for more such projects and seminar. A biofuel is any fuel derived from biomass. Bioethanol and biodiesel are the most widely used liquid biofuels. The term biofuel is used here to mean any liquid fuel made from plant material that can be used as a substitute for petroleum-derived fuel. Biofuels can include relatively familiar ones, such as ethanol made from sugar cane or diesel-like fuel made from soybean oil, to less familiar fuels such as di-methyl ether (DME) or Fischer-Tropsch liquids (FTL) made from lignocellulosic biomass. In this project we extracting the triglyceride from the sewage sludge for the production of the biodiesel, by doing this we reduced the large volume of the municipal waste in to the useful product. Although biodiesel can be produced by the Soybean oil and other many edible oils, but due to high population food crises may occur if these oils are used for biodiesel production. Use this report only for your reference and study work.